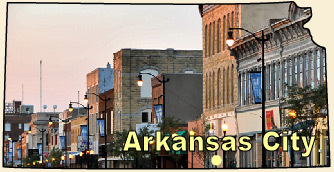 Arkansas City is situated in Cowley County at the confluence of the Arkansas and Walnut Rivers. Originally settled in the 1860s, and incorporated in 1870, the town was bolstered by the railroad. The population also grew in anticipation of the Cherokee Strip Land Run of 1893. By the turn of the 20th Century the population was around 5,000. Today's population is around 12,000. The home of Cowley College, Arkansas City's industries include meat packing and oil and gas concerns. "Ark City," as it is often nicknamed, began an official fall festival, Arkalalah, in 1928. The segregationist past of the town is well documented by Franklin Marshall Davis, who went on to become a leading African-American journalist and poet. Robert Docking, Kansas Governor from 1967-1975, was once Mayor of Arkansas City. Grant Williams, a contemporary self-published writer, and member of the Kansas Authors Club, is active in the community.